JO's -91 Mazda B2600 - Projects - Drive On Wood! I could think of nothing better than Christmas flare for you guys. Here you are. Oh, and a couple of pics below from yesterday’s funnel and gutter mount. What are those slots for on the ring inboard of the gutter? So, am I seeing this correctly? Is the funnel also an inner hopper that comes together at the atop as well? If so, how close is it to the hopper lid to allow air to the outer hopper? I suspect the holes at the bottom of the funnel is to allow air flow to continue through? The ring is a cutoff from a 12" propane bottle stand. It supports the funnel fingers. The slots came with the stand and happens to fit my needs of hopper circulation. Cold “dry smoke” returning from the condensation void will enter those slots and enter the fuel pile again under the funnel fingers. You are correct. Funnel and inner hopper is one piece. The distance to the lid is maybe 3/4 of an inch. The bolts that secure the frying pan act as spacers. Also I hope the cone shaped top of the inner hopper will prevent condensation dripping on the fuel. Thanks for the info Jan.
One more question. The heat and steam will be coming straight up through the hopper. Do you have some kind of cone to direct that flow to the outside walls? Or it seems to me the steam will get trapped under the hopper lid and drip back on your fuel? No worries Bill, you go ahead ask. Cool fumes towards the hopper wall will drop. Hot fumes in the center of the wood pile will rise. Those forces combined will create a constant circulation flow. My Rabbit filler lid is double walled. The inner lid is always hot and doesn´t create condesation. Also it acts as an umbrella that protects wood from drops falling down from the outer cold lid. If I happen to find something simular that fits my Mazda frying pan lid I will install it. Great look and work on that unit JO, cant wait to see the performance over time. Thank you for the video and pictures, merry Christmas and happy holy days to you and your family. Very nice workmanship JO, thank you for the Christmas flare. There’s a lot of good ideas there. Hope you took a lot more pictures of your build. I love the hopper and how it match up with the barrow lid and clamp lock. I hope that isn’t your wife’s pot and lid on top. If it is, I hope there is a new set of pots and pans under the tree. What are you using for a gasket under your gutter “fence” - looks like part of an old tire or inner tube? It’s a 1/2" rubber hose cut in half. It’s what I happened to have laying around. Well, the hula-balu of Christmas is over and I have to wait until tonight to play with my gift— a new pair of pajamas. I hope all of your Day was enjoyable. Now for Tom’s Questionnaire; Starting with comment 53 you say, " My Rabbit reduction is ash insulated". Isn’t the object of the deep cone going from the restriction down, to hold ash and insulate the reduction area? I guess I should go back to the Rabbit to see what you used fro a reduction area. 2. Post 62, thank you for using inches for us less knowledgeable folks. A 4 in. restriction seems quite large. My 4.3 l engine I am using and have used 4 1/2 in. restriction. 3. Post 62 The smaller pipe coming out of the larger pipe is the gas out the top of the cyclone. The larger of the two is the air going into the “pre-heater”. Then the flattened 3" pipe is the gas into the cyclone…? Where does the “pre-heated” air come out?? What is the pipe with two verticals welled to it represent?? 4. 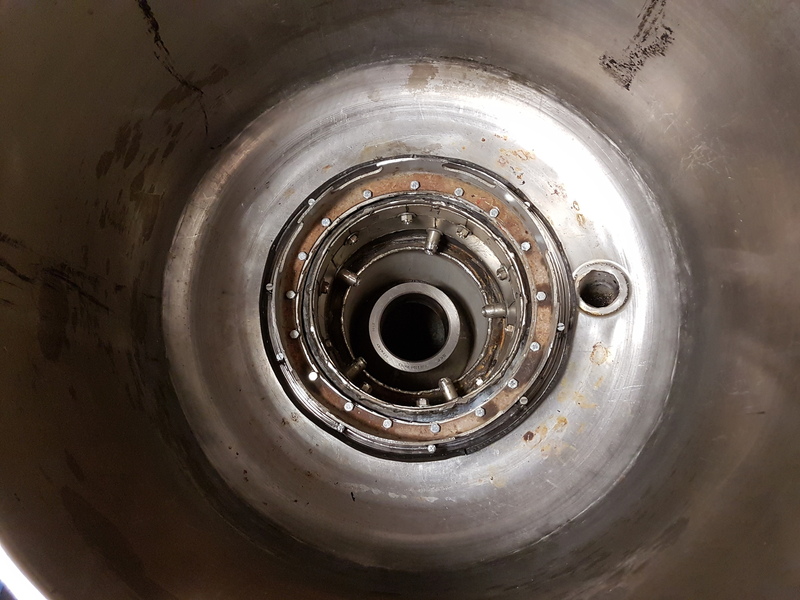 The picture looking down on the interior of the gasifier-- you mentioned that it isn’t enough, but I love that inverted cone for holding ash around the reduction area. My new one is much to hard to build and I’m still wondering if it will stay filled with ash. 5. The next pic with nozzles and insulation plates— I hope you don’t NEED those plates. My new build has nozzle like the 10 secondary (?) nozzles but no insulation plates. Post 62 still Pic of gasifier in back of truck. What is the pipe coming out of the ash area?? Going to post 81 I see it goes back into the cyclone/thingy so that only leaves Hot Air coming out and into the ash been??? The picture before the view of house/snow show the Hot Air going from the cyclone/thingy to the nozzle area of the gasifier. Post 67 How do you have the fry pan fastened to the barrel lid. Has this lid sealed tight so far? I’ve spent so much time building different lid combination and never had one that didn’t leak after a short time. 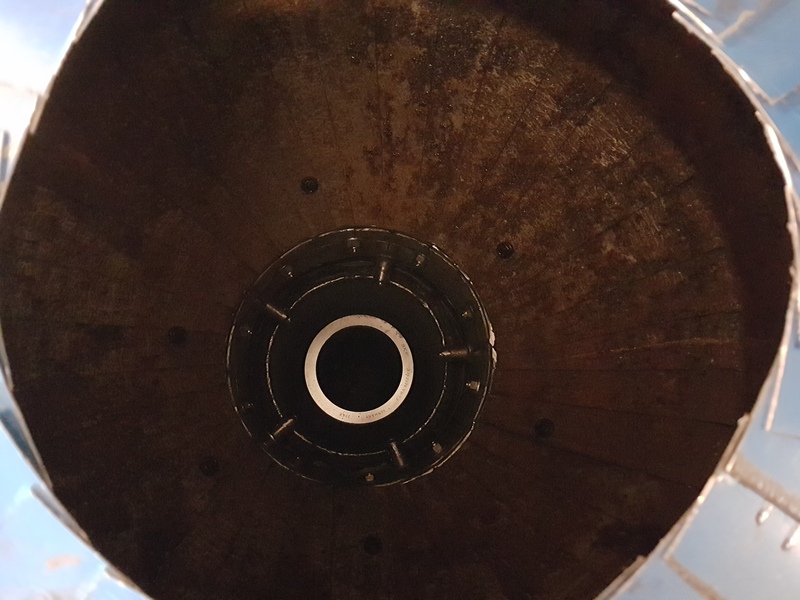 Post 81 (second pic) Looks like you held the hopper on and the “condensate ring” on by welding a ring on top of the top LP tank and drilling and tapping it. Can you reach those bolts from the top of the hopper.? I see "screws on the outside of the sealing ring. I assume those are holding down your 1/2 rubber hose gasket? You said something about a steel ring also?? Does just the weight of the interior hopper seal on that hose? And do you have a rubber seal between the hopper and the ring (that I think you added) to bolt the hopper to.?? 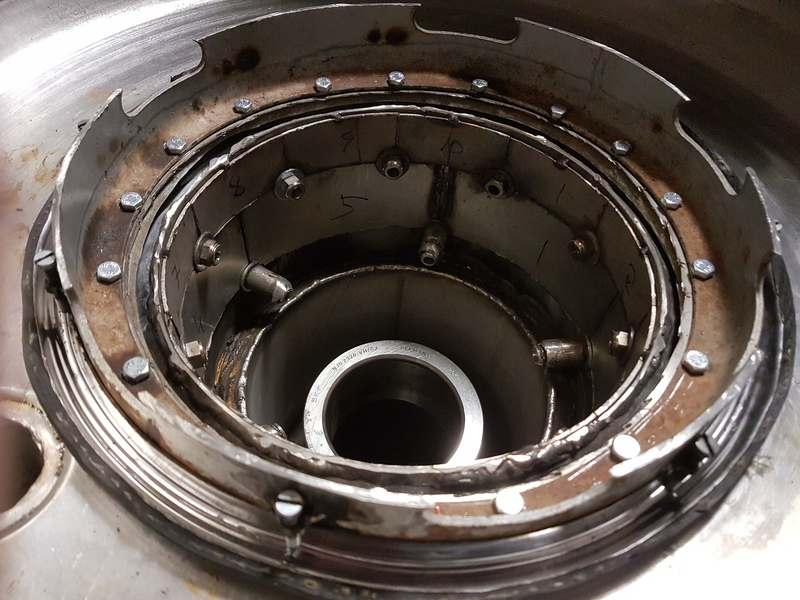 Post 81 still pic down inside of condensation hopper-- I assume you cut and bent the bottom like you did the top to form a cone going to the nozzle area-- did you reinforce the opening that slips over the seal ring?? AND THE FINAL QUESTION ( for now) I thought you were going to run on the 5 major nozzles and then for more power add the 10 secondary nozzles to the system.You and Kristijan really confuse me. I thought there were certain dimension that had to be in line for an Imbert type gasifier to work. One of the things was the total nozzle tyre area. Kristijan just throws his "fire ring in there on top of his normal nozzles and you use 5 nozzles that I think are the size required for a engine of this size then you just off the wall throw in 10 nozzles for WOT running. First of all, I agree about the hula-balu. It was nice meeting everyone but even nicer when they left. Also it’s a real strain running around dressed in clothes you have to watch out not to dirty. 1 Reduction insulation. You’re right, I use about the same way holding ash around the Rabbit reduction, only it’s a straight tube. 2 The 4" restriction. That’s 100mm. 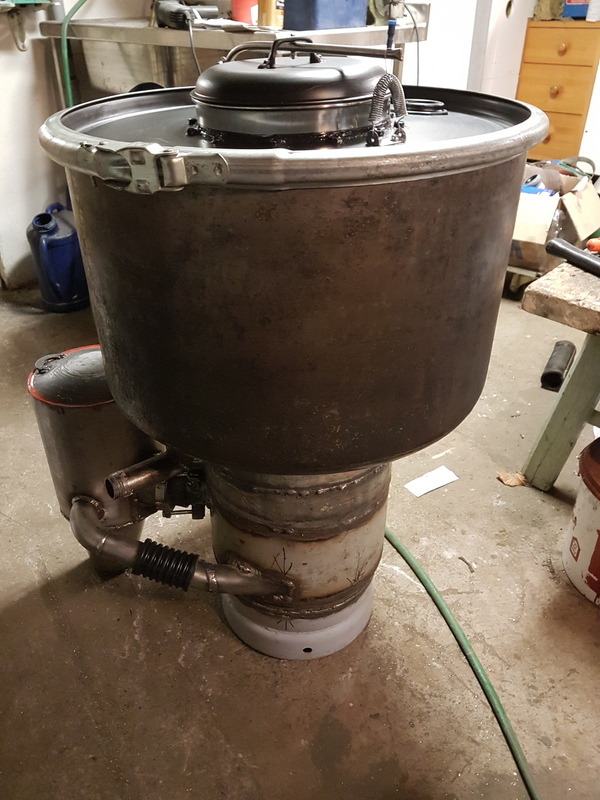 In the little Rabbit gasifier I use a 90mm restriction, still with good idle capabilities. This larger restriction has a +25% csa, while the Mazda engine has a +40% cylinder volume. I see no reason to go with a smaller restriction. Before I let the videos explain the rest I’ll just comment on your final question about nozzle dimentions. I belive those certain Imbert dimensions are important to get the proper air velocities and pentration at idle and very low demand. However I don’t think it matters much at full power. 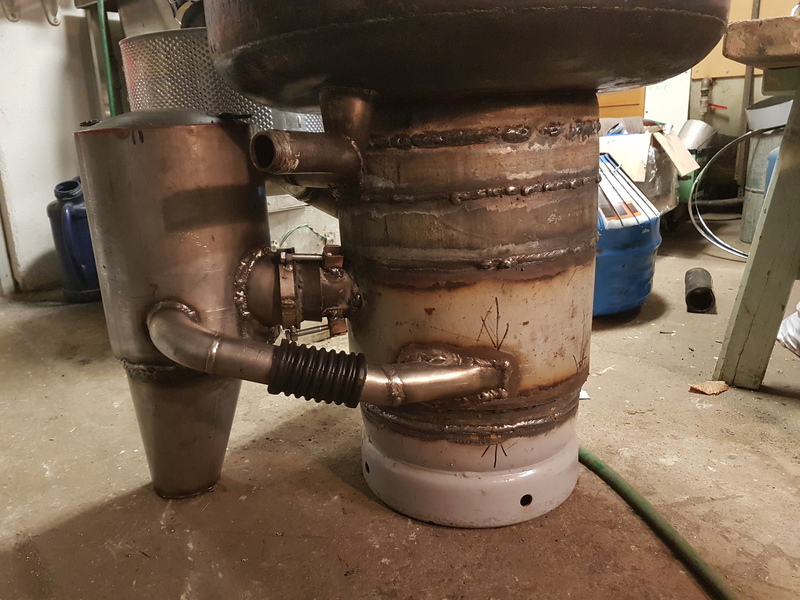 As I mentioned my upper nozzles will be turned on only at open road speeds to try make the gasifier bigger. Of course I would have liked to be able to increase the restriction opening too, but you can’t have it all. Remember, all of this is very experimental. I’m one of those who always try to reinvent the wheel. 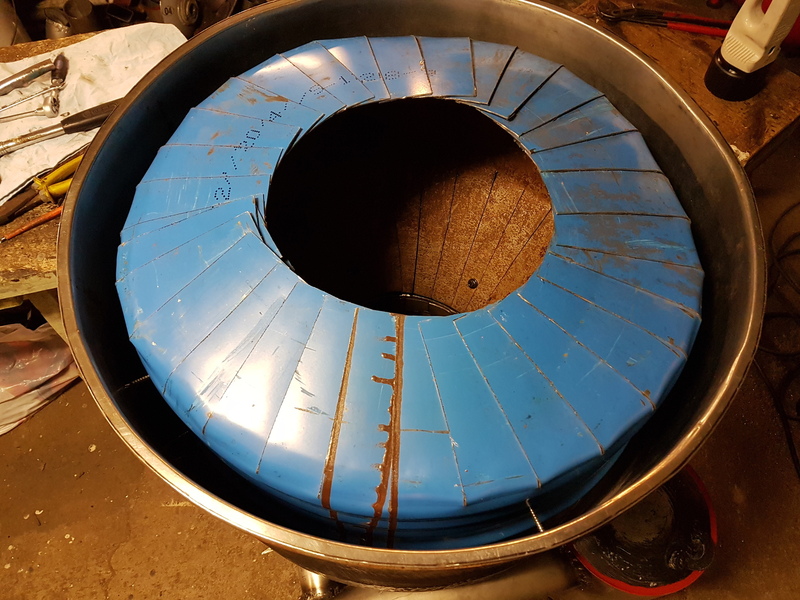 Oh, the cut in half rubber hose keeping water from getting to close to the heat on the hopper bottom, is held down with a ss ring cut out from a washing mashine drum. The ring is tightened down with bolts, and yes I can reach them from the filler lid. Looks Good jo i couldent help but notice that if you could hang a tin or aluminum layer around hopper, and then down around burn tube, you could reheat the hopper a second time, or would that interfere with the hopper condencer?? Thanks for the vidio walk around planned for Tom Collins.very well apreaciated.Just wanted too add the idea incase you were building in progress. Thank you very much for the explanations and videos. I didn’t expect a reply for awhile as I thought you were working week days. Excellent videos, very detailed. The fact that you have a mantel around the gasifier explained a lot. One last question— Do you have two air chambers? One feeding the lower 5 nozzles and another feeding the top 10 nozzles? How do you control the air coming in the lower chamber and the upper chamber? I see the pipe going to the lower chamber and I think I see a pipe going to the upper chamber. Did you flare it with all nozzles working or just the bottom 5? ( sorry this is more than one question, but it all pertains to one subject ) The way you younger people can think these designs out just amazes my old mind. GREAT build!!! TomC Thanks again for your time I know I was very lengthy as usual in my questionnaire.